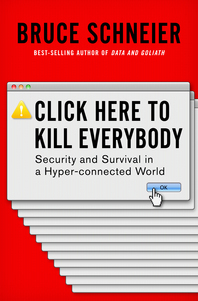 Click Here to Kill Everybody - Description | W. W. Norton & Company Ltd.
A best-selling author and renowned security expert reveals the rise and risks of a new goliath: our massively networked, world-sized web. We have created the ultimate hive-mind robot: an Internet of interconnected devices that senses, thinks and acts. Bruce Schneier calls it the “World-Sized Web”. It includes everything from driverless cars to smart thermostats, from billboards that respond to specific people to drones equipped with their own behavioural algorithms. While the World-Sized Web carries enormous potential, Schneier argues that we are unprepared for the vulnerabilities it brings. Cutting-edge digital attackers can now crash your car, pacemaker and home security system and everyone else’s. 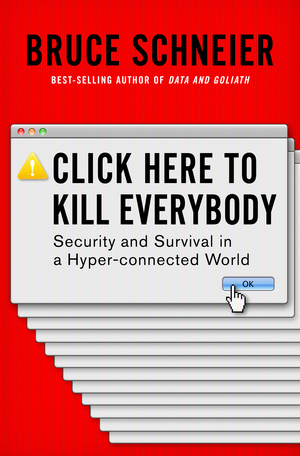 Click Here to Kill Everybody explores the risks and security implications of the World-Sized Web and lays out common-sense policies that will allow us to enjoy the benefits of this new omnipotent age without surrendering ourselves entirely to our creation. A shocking look at the ways governments and organisations track and control us and the ways we can fight back.